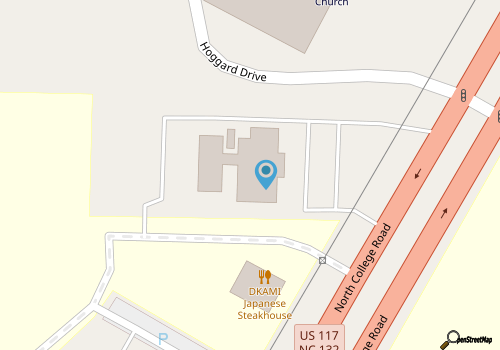 Okami Japanese Steakhouse offers a wide range of dining experiences under one extensive roof along College Road. From the traditional Japanese steak house “show,” with flying knives and freshly prepared cuisine, to the buffet-style lunch and dinners, which are a budget-friendly means of satisfying an incurable appetite, Okami Japanese Steakhouse will delight Japanese cuisine lovers on a myriad of levels. Hungry all-you-can-eat lunch and dinner guests will find multi-course meals to choose from, which start with a range of appetizers, soups, and salads, such as spring rolls, vegetable tempura, and Miso Soup, that’s followed by a number of sushi rolls, including all the classics like vegetarian asparagus or avocado rolls, shrimp tempura rolls, and spicy crab, tuna, or salmon rolls. The dinner Hibachi menu is a bit more complete and equally delicious, with special Hibachi items that center around a primary protein like calamari, Mahi Mahi, chicken, shrimp or scallops, chicken, steak, or filet mignon, which are all accompanied by clear soup and house salad, mixed veggies, noodles and fried rice, and a choice of dressing. With so much variety, and an ability to appease hungry Japanese food lovers of all tastes, Okami Japanese Steakhouse is a good place for a lingering multi-course meal, or a few rounds at the wonderfully vast in-house buffet.